Download our latest guide, “Top 9 Things to Consider When Designing Your New Kitchen” today! Republic West Remodeling’s latest guide for homeowners is now available. An amazing resource, this informative document is full of useful recommendations, explanations and more! We created this guide so homeowners can enjoy their kitchen remodeling projects and not worry about what might go wrong. By educating yourself, you’ll understand what needs to happen for your project to be successful. By following the advice in the nine steps we’ve outlined, you’ll be well on your way to enjoying a beautiful new kitchen! Your project will deliver an end result just like you envisioned it, and within your budget and schedule parameters. So claim your copy of “Top 9 Things to Consider When Designing Your New Kitchen” today! 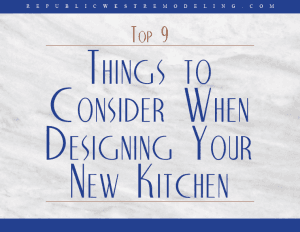 Visit https://www.republicwestremodeling.com/top-9-things-to-consider-for-new-kitchen-design to download your guide now!